Has Pioneer Book House been appropriated by the arts community as a space to exercise their own privilege? If you've had a chance to visit Pioneer Book House on Karachi's MA Jinnah Road in the past ten days you'll notice that this pre-partition era establishment is one of 12 venues the Karachi Biennale (KB17) has set up across the city. You'll also notice that the dimly lit, cramped store plays host to a rather unusual visitor - a twisted, broken-down streetlight that winds its way from the store's ground floor to its mezzanine, where it comes to rest at an awkward angle, its bulb flickering on and off. Titled 'An Ode to a Lamppost That Got Accidentally Destroyed in the Enthusiastic Widening of Canal Bank Road,' this streetlight is at the centre of a debate that consumed Karachi's arts community when KB17 kicked off last week — a debate that was sparked by accusations that this streetlight, which is a KB17 installation by artist Huma Mulji, damaged Pioneer Book House and was an insensitive use of the exhibition space. Fueled by very real anxieties about classism, privilege, ownership and appropriation, discussions about the streetlight's place at Pioneer Book House cut right to the heart of KB17's message by questioning the beinnale's motives and whether it can ever truly harness the complexities of the city it tries to represent. 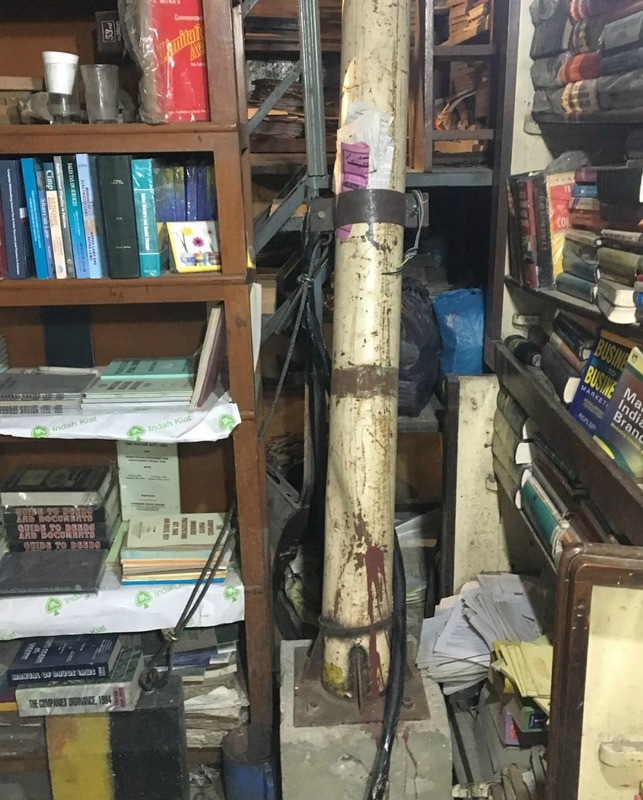 In 2016 the owner of one of Karachi's oldest bookstores decided he'd had enough. 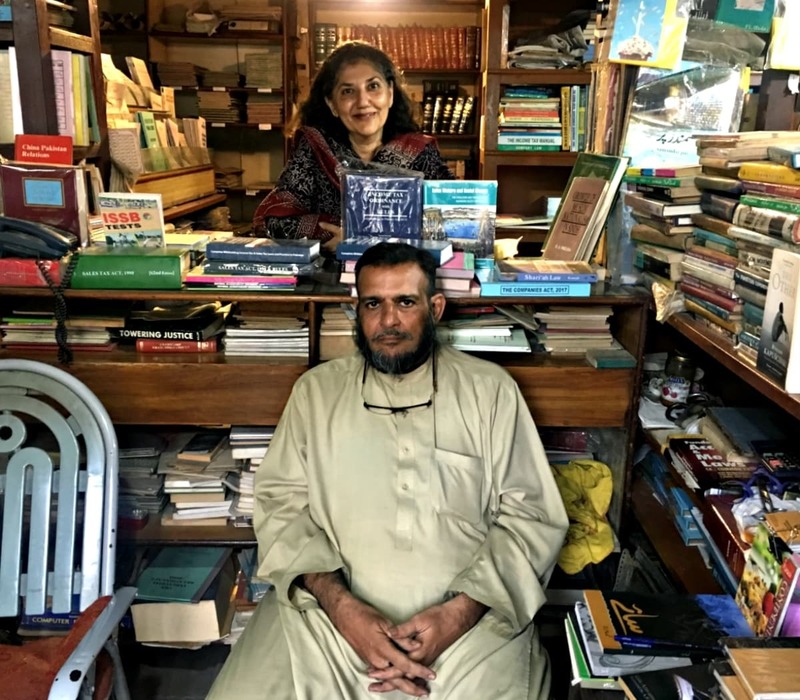 Zafar Hussain, the owner of Pioneer Book House, was ready to hand his business over to anyone who cared to take it as he was receiving barely any customers. Pioneer Book House was founded in 1945 by Zafar's grandfather Inayat Hussain Dalal as a destination to buy stationery and books on law, and throughout the 50s and 60s it drew a healthy amount of patrons as the surrounding area was heavily populated by legal and government administrative offices. Located in the historic Avan Lodge (now called One Sami Chambers), Pioneer Book House was granted heritage status in 1997 but that hasn't halted the building's overall decline — or change that has swept through the locality. What was once a bustling hub for lawyers and civil servants is now a chaotic marketplace. The traders who've set up shop in the surrounding buildings never really cared to enter Pioneer Book House, leaving Zafar disheartened. 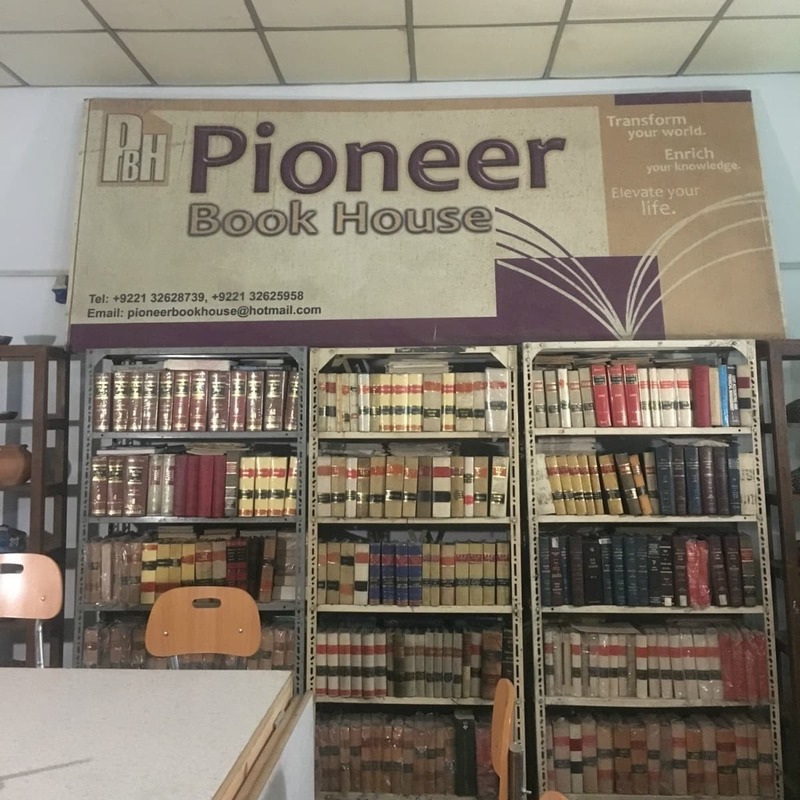 The future of Pioneer Book House seemed to be in danger until writer Maniza Naqvi stepped in. When Maniza read an article about the bookstore's planned closure she felt she had to do something about it. "I turned up at the bookshop in January 2017 and sat down with Zafar Saab, who was totally at a loss and depressed. The shop was dead," she says. "So I asked if I could clean up the shop and sort it out." Over the next few weeks Maniza cleared bookshelves, swept floors and got to know the vicinity. She asked Zafar for permission to refurbish the shop's first floor and transformed it into a gallery space and meeting room. She also set about reinvigorating the store's inventory, stocking popular fiction and non-fiction titles. Maniza frequently posted updates about the bookshop's progress on Facebook, which is how the store caught the attention of KB17's Managing Trustee, Niilofur Farrukh. "I convinced Zafar Saab that participating in KB17 would be great," admits Maniza. "KB17 held a discursive session of artists and writers here at the end of April. Fabulous.Then in July we heard that Huma Mulji had chosen the bookstore for her art. I was over the moon." 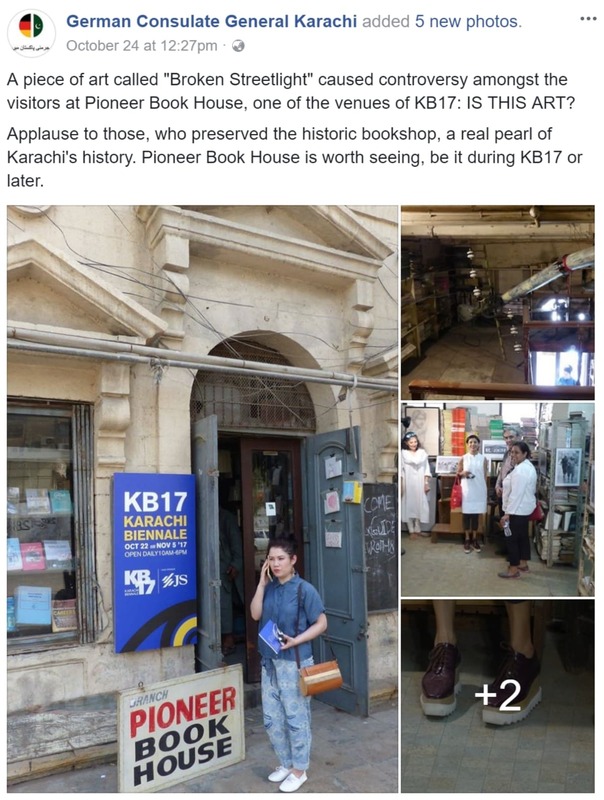 I first heard something was amiss at Pioneer Book House after KB17's opening ceremony, via a series of Facebook posts that called Huma Mulji's installation "vandalism" and/or "junk". Sharing pictures of the streetlight on October 22nd, journalist Jahanzeb Hussain said: "I thought this art was an act of erasure: it did not care about what it did to the space it is housed in... The owners of the place told me that they had no idea that this is what the installation was going to be like; the walls of this heritage building got ruined during the process." Other commentators quickly jumped in with their own critiques of both the art and KB17 in general, including the German Consulate in Karachi. Maniza, who describes herself as the "totally voluntary" caretaker of the bookstore, took to Facebook a few days later to claim that the bookstore's walls had been damaged by the installation, and that the artist, Huma, had not sufficiently described the implications of her work before she set about installing it. I visited the bookstore soon after reading these posts and found Maniza and Zafar comfortably perched just inside the store's entrance. Middle-aged, bearded and stoic, Zafar was totally entrenched in his seat and barely moved for the duration of our meeting; a visual reminder of how the bookstore itself appeared fixed in time, its dusty shelves and tiny interior a throwback to times past. Maniza, on the other hand, flitted from corner to corner as she described how the streetlight was installed. According to Maniza, she was in the United States when Huma came to Pioneer Book House to install the streetlight in August. "I was never consulted on the concept neither was Zafar Saab," she says. "[When Huma came by] he assumed I knew about it and he trusted me. 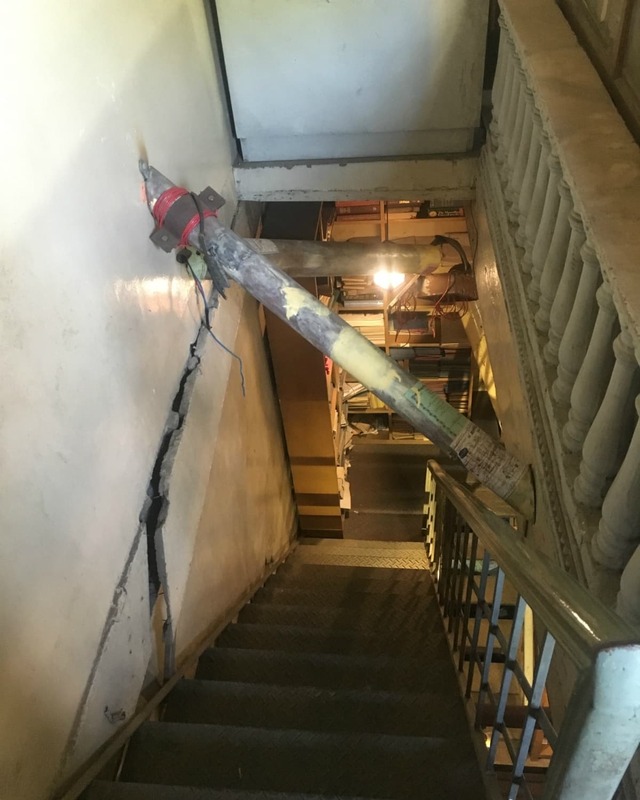 But I didn't know anything of what was going on until Luqman Zafar, Zafar Saabs' son sent messages and photos... after looking at the damage in the building, I couldn't sleep at night." It is clear that Maniza is deeply attached to the bookstore, at this point in our conversation tears spring to her eyes. But all this begs this question: why didn't Zafar Saab voice his concerns to the artist himself instead of relying on Maniza's approval? "When I was invited to KB17's launch and I asked Zafar Saab to come with me, he said I should go alone with he wasn't comfortable mingling with 'this crowd'. He said, 'humara bas nehi chalta angraizi bolney walon ke saath'" says Maniza as Zafar Saab nods along. In saying 'this crowd' Maniza is referring to the artist community that engages with Pakistan's major art schools, high-end galleries and high-profile festivals like KB17. "Artist ko sense hona chaheyay, mujhey kya pata kya karna kya nehi karna chaheyay?" adds Zafar Saab of the installation. This admission, as well as Zafar Saab's reluctance to speak directly even to me, cuts to the heart of the matter: in a society like Pakistan which is socially, economically and linguistically stratified, the artist and the public often lack a common language with which to speak to each other, creating conditions ripe for an abuse of power and appropriation. Maniza wonders if what has happened at Pioneer Book House is in fact a product of this power imbalance. "I know other public spaces that participated in KB17 had objections to some artwork, and those objections were respected... so then why did they do this with a private space like Pioneer Book House? This brings to mind the issue of stratification," Maniza says. "Did the artist choose this space because she understood its context, or did she choose this space because she thought this is where she could simply have her way? Perhaps I'm being unfair. But I can't help but think how the artist could enter this tiny little bookstore and think 'hmm, I'm going to do some welding and drilling and endanger this structure'." "As she was leaving the artist asked me if I could get someone to spit paan onto the pole," claims Zafar Saab. "To make it look like it fit in." A miscommunication or something more sinister? Away from the chaos of MA Jinnah Road, I find Niilofur Farrukh at KB17's Clifton office. "I've supported the Pioneer Book House since its inception," says Niilofur. "And Huma is a very responsible person who I have great respect for as an artist." 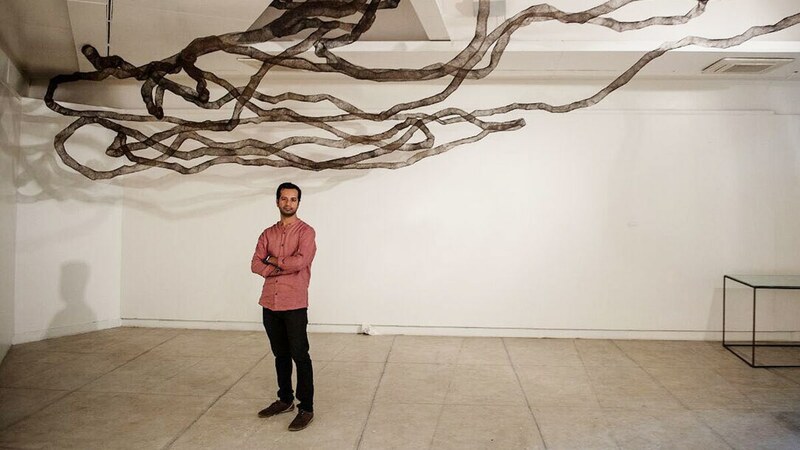 "When it came to installing the piece, Maniza was not here," continues Niilofur. "Zafar Saab is not a very communicative person. And when Huma began her work, Zafar Saab never got back to us about anything." Of Maniza and Zafar Saab's objections, she says: "There are two aspects to this disagreement: first, that Zafar Saab could not relate to the aesthetics of the work. And that's fine, we're here to start a conversation about contemporary art. Second, he felt the intervention done to support the work had not been good for the building. To that I told him that when we exit this space, we will repair it." Niilofur views the debate surrounding Pioneer Book House as a communication lapse rather than an example of appropriation. "I don't look at this as a class issue. We haven't come to this space overnight, I have a forty-year old career in this field. A lot of our artists also come from that space." The artist herself has remained silent on this issue -- until now. When I reached out to Huma she appeared dismayed about the response to her project, which she feels is a commentary on the very anxiety expressed by Maniza and Zafar Saab. "As some of my earlier works have attempted to do, I wanted to produce a work that resonated the anxiety of the city. 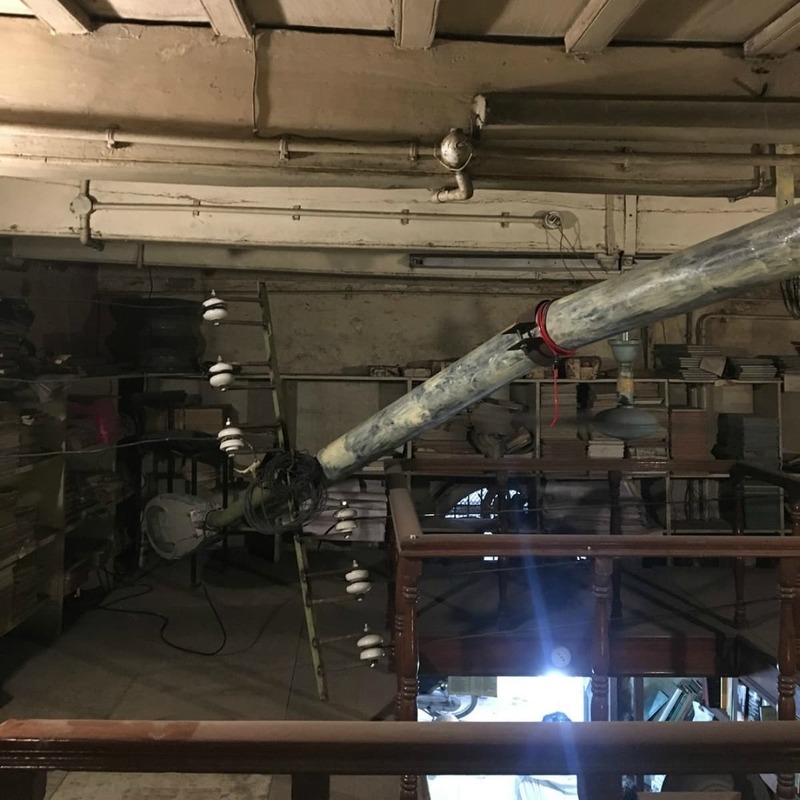 The scale of the lamppost, and its unexpected entanglement with the mezzanine floor, along with the un-rhythmic flickering neon light, intentionally amplify a sense of trepidation, and unease," says Huma. "But the flickering of the light, and the happy survival; that is, the restoration of the bookstore, are both signifiers of a resilience, and it is ultimately an optimistic work." "At no point in our conversations did Zafar Saab express any unease over the work, and I took that at face value," says artist Huma Mulji. "Some days there was curiosity, other days, an indifference." Of her interaction with Zafar Saab, Huma says: "After the KB curatorial team agreed to my proposal I took these ideas to Zafar Sahab. I described the work to him and discussed what the process would be. He consented to it, somewhat amused and full of questions." "Because this consent was explicitly granted, the work cannot be categorized as vandalism," Huma says. "Over the course of the installation, there was a camaraderie that developed between everyone working there. At no point in our conversations did Zafar Saab express any unease over the work, and I took that at face value. Some days there was curiosity, other days, an indifference." "As is the norm in most art exhibitions, artists or exhibition teams refill and repair these holes at the end of the event," she clarifies. "Heritage site or not, Pioneer Book House feels like an amaanat. I have worked with material throughout my artistic life, and engaged with the building with an awareness of its fragility, but like an artist, pushed the limits, in this case, of scale, as far as I safely could." An intervention within an intervention? Huma points to another aspect of the incident at Pioneer Book House: the validity of Maniza's initial intervention itself. "When you say 'the owners allege…', this shifts to another issue: who is the owner of this property? The site seems to belong to an individual (Zafar Saab). Does he claim ownership or is the owner of the shop someone who has recently contributed to its restoration (Maniza)? If it is the latter, does this new owner automatically own the previous proprietor, and his voice, as part of the legacy of the purchase?" "This opens up a Pandora’s box of class privilege, which is conveniently never discussed in Karachi," continues Huma. "The art world, (all of us) carry immense privilege, and we have all exercised our privilege in the making of KB17. The opportunity to create a site specific work in Karachi, the privilege to have and broadcast an opinion on what is art and what is not, the privilege to invite some artists and leave others out." "All of these spaces are problematic, and symptomatic of a deeply inequitable society," Huma adds. "Beyond the art world, this entitlement or power plays out in various ways in our everyday interaction with the city and with each other." It is in fact true that Maniza's intervention to 'save' Pioneer Book House can also be viewed as an act of entitlement, of privilege. It is in fact true that Maniza's intervention to 'save' Pioneer Book House can also be viewed as an act of entitlement, of privilege. Though her efforts are to restore a Karachi landmark that might've fallen through the cracks otherwise are invaluable, it is slightly disquieting to watch Zafar Saab interaction with her -- he is watchful and mostly silent. In many ways, she speaks for him. And while Zafar Saab reaps the financial benefits of an upgraded bookstore, it is Maniza who gains recognition and publicity within the arts community for her effort to save the shop. If asked, I would venture that he would identify her, too, as 'that crowd' -- the crowd he isn't a part of, an English-speaking, bienalle-attending crowd which has the privilege of spending days debating the artistic merit of a lamppost on social media. "Art has always carried this label of being elitist and I think artists themselves have withdrawn into this space," admits Niilofur. 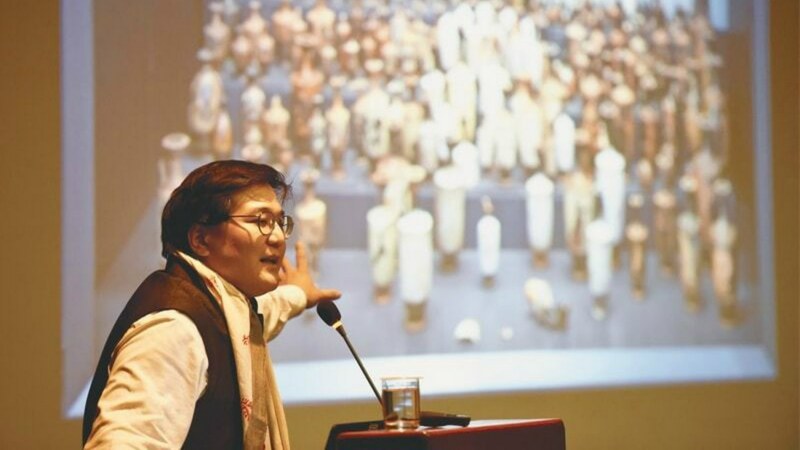 "They only show at galleries, there are no public spaces to showcase art as such. But the KB17... attempts to address that." 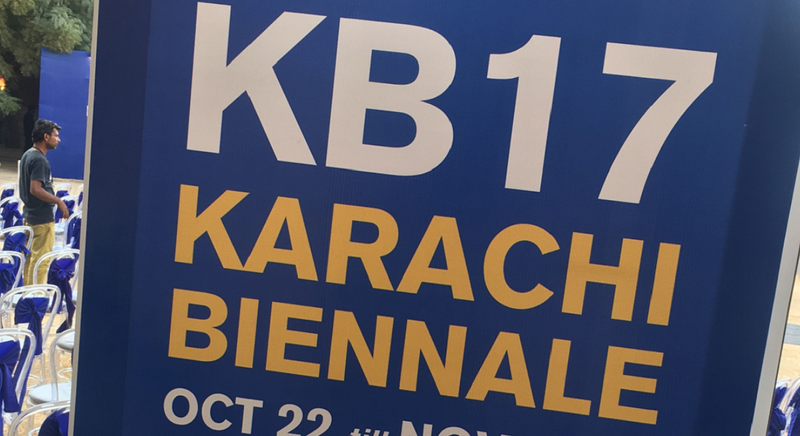 As with any other major public event, The Karachi Biennale faces its share of criticism. With the exception of a few truly public exhibits (like Jamal Shah's installation at Frere Hall) most of the art is still housed behind gates, in buildings that are protected by armed guards. The lamppost at Pioneer Book Store may just turn out to be the most authentic work at KB17, in that it organically sparked a much-need conversation about the privilege and social stratification the art world must navigate. Art by some of KB17's most celebrated artists is housed within spaces that are largely inaccessible to the general public, like Shahzia Sikander's video installation at the Alliance Francaise. Wouldn't it have been more meaningful to have her work broadcast in a public square, displayed as it was in the United States -- at Times Square, arguably one of the most iconic entertainment hubs in the world? "To put up work in a public space is a tremendous challenge. You have to communicate, you have to create an impact and you also have to be true to your own work," admits Niilofur. In Pakistan on a limited budget, its clear this is far from the easiest thing to achieve. In this way, the lamppost at Pioneer Book Store may just turn out to be the most authentic work at KB17, in that it organically sparked a much-need conversation about the privilege and social stratification the art world must navigate. And for now, the art world seems to be navigating this gracefully. On Maniza's Facebook post, KB17 chief curator Amin Gulgee pledged that "the KBT team will respectfully supervise the removal of this installation after November 5th," which is when the biennale ends. 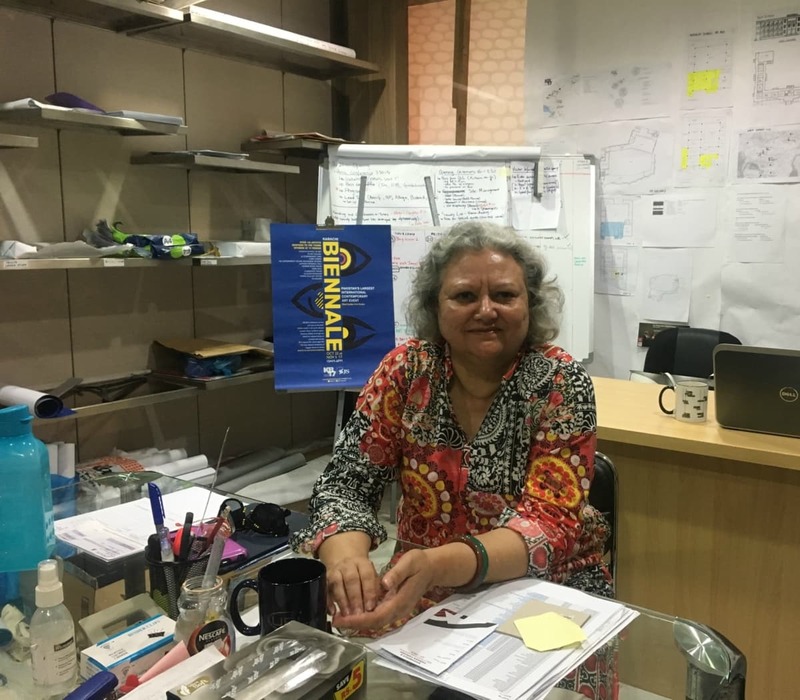 For her part, Maniza recently posted on Facebook that she was happy Pioneer Book House was attracting customers, and expressed her support for the Karachi Biennale. Zafar Saab, though still quite reticent, is tentatively engaging in debate with those who enter the bookstore and inquire about the art. And the lamppost? Though the process of its installation is problematic, the more time I spent in the bookstore the more it -- grew on me. Uprooted from its proper place, twisted and torn, removed from its purpose and cast as the unlikely villain in a high-profile tiff in Pakistan's art scene, the lamppost is strangely sympathetic for its total lack of agency. And yet, it is defiant, quietly flickering on and off. It bears silent witness to the conversations that hum around it. Perhaps it is grateful that people are talking about art at all. Jamal shah's installation is a blatant rip off of fahim rao's work. Stop glorifying blatant plagerism.